It's Hip 2 Serve! 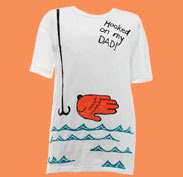 : FREE Family Event at Michaels: Get Hooked on Dad! If you do not have any plans today, then you may want to load up the kiddos and head on over to Michaels from 1PM-3PM. Your kids will be able to make a special T-shirt for dad to wear and decorate it for free using the provided paint supplies (Note: You will have to purchase the T-shirt)! This offer is available in all Michaels stores while supplies last; ages 5–12 are welcome. The best part is that you don't have to clean up the mess!